I’ve not done as much as I hoped as I was concentrating on my other long term project, my Tall Year Square etui. Now that is finished I’m hoping to spend more time getting this rather large quilt finished too. Excuses over, I have managed to finish the rows of houses, I’ve stitched quarter of an inch around the skyline and also run a stitch zig-zagging across the middle of the little houses. I’ve learnt that paper piecing does not make for easy quilting! My quilting isn’t perfect but it’s quilted. The backing fabric is quite a busy but subtle soft purple which has the big advantage that my quilting doesn’t particularly show up on it. I have checked however, and I think most stitches are getting through to the back! I’m thinking of stitching some nice straight lines like rays from the sunflowers in the corners and then this border is complete. It’s quite a nice feeling when it’s a struggle to fit the area you’ve quilted on a photo easily! 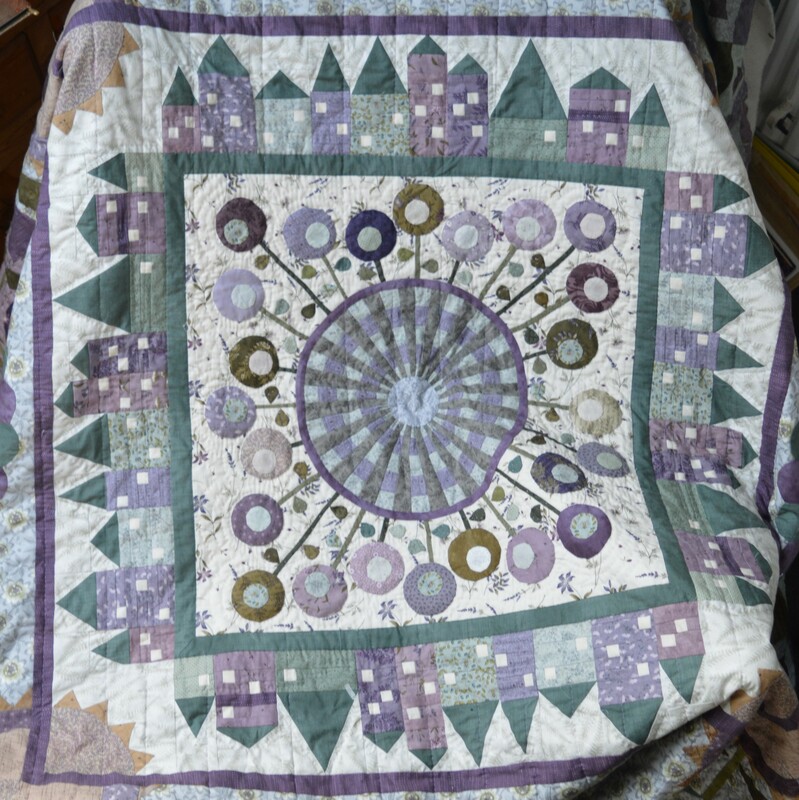 This entry was posted in Down The Rabbit Hole, Quilt-a-long, Quilting and tagged Down The Rabbit Hole, Foundation Paper Piecing, Hand-quilting. Bookmark the permalink. 20 Responses to The End of the Road! Well done, Margaret, I think this was probably the most difficult section to quilt. MAy you needle glide smoothly thought e next section! Such a pretty quilt! It’s coming along nicely. I hope the next part is easier to quilt. Thanks Gail, I hope it’s easier too! Your quilting is looking really nice. 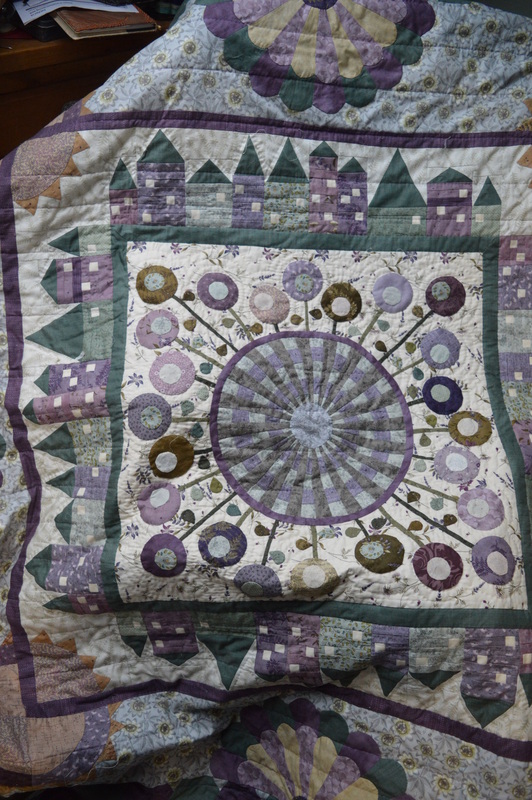 The whole quilt is gorgeous! It looks beautiful. I so admire your hand quilting. Loving your quilt. Plus like your blog. I have a link on the side bar of my blog but this time your photo over takes and wondering how to sort this. Is there something I need to do or is it your end as the others don`t do this. The only way that I know is to delete your blog from mine which I don`t really want to do as I enjoy reading your blog and it`s a reminder being on my side bar. Sorry to say still the same only for this post,not your last. Hope this comes right soon. Any way happy stitching. Lovely! Can I request that you make the photos clickable, as I can’t see any of the detail, and I’d like to be able to zoom in? I’ll send you an email with a step by step and pictures! Paper piecing does make for harder hand quilting,lots of layers to try to go through. It’s beautiful,and imperfections are what give it personality .😀 you doing great! I love this quilt and love your colors! Great work! Oh, yeah–quilting over paper piecing can be very difficult! But no one is ever going to inspect every stitch so don’t obsess to much. I’m trying to make sense of what I’m seeing–do you still have a lot of basting lines running in a grid? I had the quilt machine basted by a long armer first as I just didn’t have a big enough area to do it myself, I’m taking the stitches out as I go along and I’m sure the lines will disappear in time.